Physical characteristics: Sulawesi red-knobbed hornbills are black with a white tail. They have a high, wrinkled, red casque. Necks are rufous, reddish, in males, and black in females. Their beaks are ridged and yellow with blue throat skin. Adults are 27.6 to 31.5 inches (70 to 80 centimeters) long. Female weight is unknown, and male weight is between 5.2 and 5.5 pounds (2.4 and 2.5 kilograms). Geographic range: They are found in the Indonesian island of Sulawesi and nearby islands of Lembeh, Togian, Muna, and Buton. Habitat: Sulawesi red-knobbed hornbills prefer lowland rainforests, particularly at altitudes below 3,600 feet (1,000 meters). Diet: They eat a very wide range of fruits, mostly off of the top of the forest's canopy. Behavior and reproduction: The Sulawesi red-knobbed hornbill is a non-territorial bird, that ranges across a wide area of land. They are usually seen in pairs, but also observed in large numbers, usually fewer than 120 individuals, while feeding at fruiting figs trees. They emit a loud barking call that can be heard for more than 1.2 miles (2 kilometers). Sulawesi red-knobbed hornbills assist in the scattering of seeds and growth of plants because they eat many fruits. Nesting begins in June or July, at the end of the rainy season so young can feed during the fruit season. Nests may be built near others, often up to ten mating pairs per 0.4 square miles (1 square kilometer). Females usually lay two to three eggs, with an incubation period of between thirty-two and thirty-five days and nestling period of about 100 days. Sulawesi red-knobbed hornbills and people: People believe that the feathers and casques of Sulawesi red-knobbed hornbills are filled with powers that give the owner protection from all types of problems. Their feathers and casques are, therefore, used to decorate headdresses and drums for traditional warrior dances. Their meat is also eaten by people. del Hoyo, Josep, et al., eds. 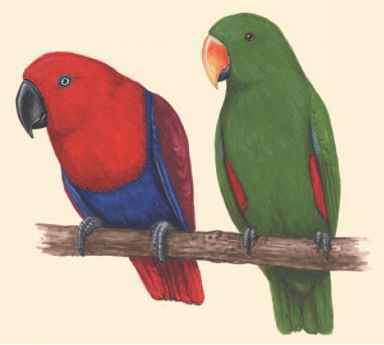 Handbook of the Birds of the World. Barcelona: Lynx Edicions, 1992. Fry, C. Hilary, and Kathie Fry. Kingfishers, Bee-Eaters and Rollers: A Handbook. Princeton, NJ: Princeton University Press, 1992.